CONCRETE BLOCK PAVING OR PATTERN IMPRINTED CONCRETE? So, you want a new driveway and you’ve whittled your options down to two, Concrete Block Paving (CBP) and Pattern Imprinted Concrete (PIC). But which should you choose? Let’s take a closer look at these two concrete options for driveways. CBP first became popular in the late 70s and early 80s when choice was very limited when it came to styles and colours. A few simple designs and a hand full of colours were about as exciting as it got. However, the market for block paving has expanded immensely and the manufacturing industry has advanced with it, which in turn means there is now a range of products available to the customer. Styles include traditional and contemporary designs, with a wide range of colour, texture and material choices, including concrete and natural stone. PIC is a relative new comer to the driveways scene. A layer of concrete is poured over a suitable sub-base and a colour is applied along with a colour hardener. The wet concrete then has a patterned matt applied to it to create the effect required. Designs range from Ashlar Stone, Brickwork to Textured stone. The aim is to replicate another material and give the plain concrete a more interesting finish. So what are pros and cons of each product? CBP offers a long-lasting and attractive finish to complement your home. The wide range of styles, colours and textures mean there are options to suit everyone. This relates to the most obvious benefit, the aesthetics. CBP is also extremely durable and will last many years with the correct maintenance. Should you need to uplift any areas due to movement or for access to services etc, this is easy with CBP as areas can be reinstated with minimal fuss. CBP also comes as a permeable option that requires no additional drainage. This complies with planning regulations relating to surfacing of front gardens. The downside to CBP can be issues around installation and not using the correct sub base. Where areas appear to sink or movement occurs, it can be down to what the product is laid on. The common mistake is to think that the product has failed rather than the sub base. However, this should not be an issue if you select a qualified installer, such as a Marshalls’ Register Member. Some would argue that the cost of CBP can be a negative, but in fact, it can be similar and sometimes cheaper than a PIC driveway. 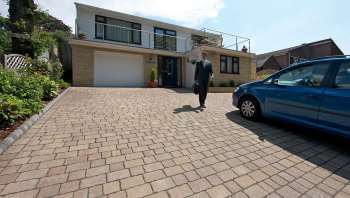 An average driveway in PIC (including installation) can cost in the region of £25 – £130 per sq metre. A typical CBP driveway can cost £45 – £70 per sq metre, proving that CBP is not as expensive as some may think. PIC is a popular alternative for many people due to the cost and replica finish it provides. One of the major benefits of PIC is the ability to cover large areas quickly. The wide range of designs offer similarities to CBP, however the aesthetics can be inferior due to the use of patterned matts and in instances where they are not quite aligned it can look poor. A common issue with PIC is that it is prone to cracking in areas. This can be a problem if the cracks become large and unsightly. Patch repair is possible, but in some cases it requires whole areas to be resurfaced and the likelihood that a repair will perfectly match the original installation is slim. Another issue with PIC is that extra consideration needs to be taken with regards to drainage and underground services. PIC is non-permeable, meaning without proper drainage it does not comply with planning regulations for surfacing of front gardens. Furthermore, if access is required, for example upgrading gas pipes, PIC will need to be broken out and re-patched, potentially leading to issues in matching the existing surface colour and finish. Other potential issues relate to durability and maintenance. The sealant that is applied to protect the colour will need to be reapplied every two to four years, especially on heavily trafficked areas such as a driveway, which can wear quite quickly, exposing the plain uncoloured concrete beneath. In most cases the sealant makes PIC very slippery in winter when surfaces ice over. This is often very dangerous, especially for young children and the elderly. Both products have their merits, but CBP comes out on top, not only when it comes to driveways but patios and pathways too. Choosing from a multitude of styles, shapes, colours and finishes, this product can be laid in different patterns to complement the look of your home. CBP will give you the long-term performance that PIC cannot match. Precast concrete permeable paving (CBP) can help in the fight against flooding and pollution and will also meet new rules which could otherwise result in action by your local authority or make selling your property more difficult.